South Africa’s Deputy Minister of Communications, a young, vivacious go-getter, grabbed the bull by its horns to make an unbelievable difference in government and the lives of several ordinary people. South Africa’s communications spectrum is very broad, as it encompasses professionals who create and deliver news and those who push information to the public, namely public relations and marketing practitioners. Those who study the interplay of media and society are also catered for under this wing. The Rainbow Nation’s struggling media and communications industry is currently battling with massive and weighty issues that include the digital terrestrial television migration. Seemingly as a way of addressing this challenge, early this year President Jacob Zuma created the all-new Department of Communications, which was branched off from the inclusive Ministry of Telecommunications and which now includes more functions that fuse pushing and delivering information. This department’s role includes communications policy and strategy, information dissemination and publicity, and South Africa’s international branding. The new ministry is now solely responsible for overseeing the Independent Communications Authority of South Africa, the South African Broadcasting Corporation (SABC), Government Communication and Information System, Brand South Africa and the Media Development & Diversity Agency. The Communications Ministry has been in the public eye lately after Faith Muthambi became its sixth minister in five years. Mathumba replaced Yunus Carrim, who in succession replaced Dina Pule, Roy Padayachie, Siphiwe Nyanda, Manto Tshabalala-Msimang and Ivy Matsepe Casaburri since 2009. Led by the veteran administrative stalwart Muthambi, her deputy is a young, vivacious go-getter who was raised in rural South Africa but grabbed the bull by its horns and is today making an unbelievable difference in government and in the lives of several ordinary rural citizens. 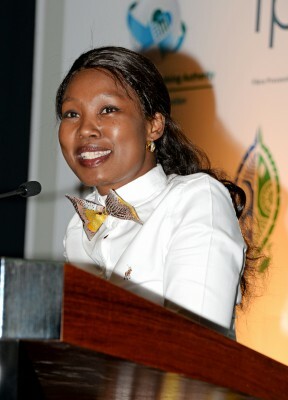 Born in Sakhele Village in Mthatha some 35 years ago, Stella Ndabeni-Abrahams is currently the Deputy Minister of Communications following her appointment last year. She had previously served the Communications Ministry in 2011 prior to her latest appointment and her rise to the top has been meteoric since becoming an MP in 2009. Her long journey started from Holy Cross Senior Secondary School in Mthatha where she matriculated—but it is how she evolved from being a mere receptionist into being a deputy minister in one of South Africa’s most powerful departments which makes everyone take notice. “I landed a job as a receptionist at a security firm. After two years there, I resigned and embarked on some short courses with Fort Hare University. When I look back, I’m one of the people who grew up in the villages where there wasn’t any electricity or water. There was this vibe about Nelson Mandela when we were growing up and I took it upon myself to make a difference in my community,” she said. Before being appointed in ministerial roles, Ndabeni-Abrahams confessed that she moulded her skills through her life experiences and some of the roles she occupied before assuming government office. “I learnt how to survive in difficult conditions. I did not get to spend much time with my dad because he was always away on duty, since he was a migrant worker—but it made me realise the importance of family; the importance of being together all the time. The second thing that I learnt about was integrity. If you do not have food today, it doesn’t mean that you will still lack tomorrow. Discipline and respect also come in handy,” she professed, adding that respect breaks barriers. She is one of those who would like to see changes to the South African Constitution. Ndabeni-Abrahams is a recipient of the Premier’s Entrepreneurship Recognition Award for her involvement in voluntary activities aimed at improving people’s lives. “If you don’t respect people, you are bound to make them not respect you. Through respect we also receive blessings. How you approach people and how you respond to their problems is equally important,” she concluded, before divulging how she hopes to assume her duties. But in a department that has been lashed out at for corruption and which has racked up its fair share of criticism—like all government departments—for failing to deliver, she has seen some positive strides being made in terms of digital migration. South Africa is well endowed with communications resources. The public broadcaster alone has 19 radio stations and four television stations. South Africa is taking concrete steps toward introducing digital radio broadcasts using a standard known as DAB+. The move will cast greater competition in the radio sector, with digital eventually likely to replace the familiar FM and AM dials. October will mark a new era for South African radio, as it has been earmarked as the month that will witness the testing of digital radio technologies by state-owned broadcasting signal distributor, Sentech. The trial will also be done in partnership with the National Association of Broadcasters and the SABC. “We are overly responsible for communications and we hope to envisage clear communication platforms. Having travelled the journey from 1994 to now, we learnt that although we have achieved so much, there are still some challenges. It is not about the government, but it’s about everyone because we all have a role to play,” she said. The deputy minister also added that being strategic means communicating the best message, through the right channels, measured against well-considered organisational and communications specific goals. “One problem that we are facing as a country is that the young do not understand where we are coming from. That said, will they be able to get qualifications that will respond to where this country is going? One of our mandates is to ensure everyone has access to information. We would have achieved one of our goals,” she testified. Interestingly, Ndabeni-Abrahams is passionate about branding South Africa and believes that platforms such as Facebook, Twitter, Instragram and YouTube will push the country’s brand to another level. “The government and private sector need to work together in order to build efficient communication models. We can be brand communication ambassadors of the country when we understand. The challenge we have is that we don’t have a common message of the country. We are South Africans and we have that obligation of branding our country in a beautiful way. 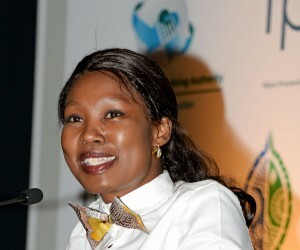 We need to complement each other as South Africans and appreciate each other,” she stipulated. She has served as the Provincial Secretary of the Eastern Cape Youth Economic Council and boasts a plethora of qualifications that include a Commonwealth Telecommunications Organisation Diploma in Telecommunications and Management Systems. With her ministry taking on an industry that has been labelled as directionless, Ndabeni-Abrahams hopes to orchestrate clear and concise directives, decisions and leadership. Her passion lies in empowering women and young people. “I am passionate about youth and women empowerment programmes. I am totally committed to the fight against Aids—the economic aspect of HIV/Aids and how it affects families,” she disclosed. The soft-spoken deputy minister will be under pressure to deal with pressing issues such as the SABC that has been plagued by mismanagement, corruption, infighting and political bias. “Every communications department should function appropriately. There must be infrastructure that will enable everyone to have access to communication. I have a responsibility of sharing information at every event I’m called to attend. We need to have our own story as a country and share it with the world, whether it’s through community media or national television,” she pointed out. The Department of Communications also has that challenge of infusing communication efforts with an agenda and a master plan. “Strategic communication is very important for capacity building because it enables us to expand our economic growth. It creates that platform for people to be innovative through information gathering and sourcing, and in turn create jobs. As a department, we face several challenges and we encounter some challenges with other government departments. We have that responsibility of co-ordinating all government departments and creating those communication structures that allow easy flow of communication,” she explained. Ndabeni-Abrahams is on record as stating that her department has the responsibility of educating, informing and entertaining every South African citizen. She recently donated OpenView satellite decoders to poor families in Duncan Village, East London. She also handed over 30 tablet cyber labs to learners from St Patricks and Sandi Senior Secondary schools. “We are happy as government. It is our responsibility to ensure we uplift the rural communities. We are tired of people who are flocking to cities because they want to get better opportunities and facilities; we are saying it’s high time we bring Joburg where people are,” Ndabeni-Abrahams said. The first-born child in a family of five, Ndabeni-Abrahams has two children and married her long-time beau, Thato, at a much-publicised fairy-tale wedding in Umtata in 2012. “I have two children—a beautiful daughter and a handsome son. I am married to Thato and I thank God for my husband because of all the support that he has given me,” she said with a smile.